In the anti-sharia laws being enacted today in states across the country, we see a modern-day example of laws targeting one group but ultimately affecting many others. 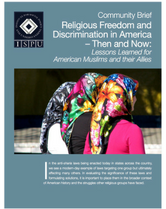 In evaluating the significance of these laws and formulating solutions, it is important to place them in the broader context of American history and the struggles other religious groups have faced. As part of ISPU's larger project, Islamophobia: A Threat to All, this brief puts the campaign for anti-sharia and anti-foreign law statutes within a broader histori- cal context, beginning with an analysis of anti-Catholic laws, including current controversies and strategic responses. The focus is on 1) Blaine Amendments, which were designed to limit Catholic influence in public schools, and 2) anti- religious garb statutes. The Blaine Amendments are now used more broadly to limit the participation of any religious school in state-funded programming. This analysis is done in parallel with more recent laws that attempt to target Muslims, specifically anti-sharia/anti-foreign law statutes. It provides American Muslims a historically-grounded view of their current status in their nation. They are not alone, or unique, in their experiences of discrimination. It explains to Americans of other faiths how anti-sharia laws affect them. Doing so provides a compelling reason, beyond moral persuasion, to also be invested in countering these measures.